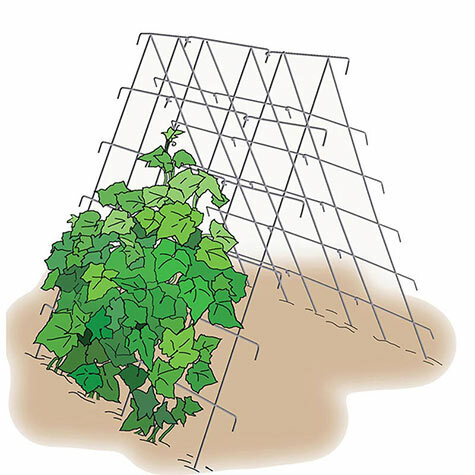 Shop Cucumber Supports | Gurney's Seed & Nursery Co.
Sides and 48 x 42 in. Save space in your garden, wrangle rampant cucumber vines and keep fruit clean and off the ground for easy picking. This support is a favorite in our test gardens, and we're sure its design and versatility will make it a favorite in home gardens too. Made of sturdy, galvanized steel, this one-piece support unit unfolds into the shape of a tent. Each side is 48-in. tall x 42-in. wide. The height of the support will depend on how far apart the panels are placed and how far the panels are pressed into the ground. If cucumber plants are spaced six inches apart, it's large enough for 14 cucumber plants. Works for other vining plants, too. Can be folded for easy storage between seasons.